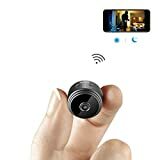 · [WIFI REMOTE CONNECTION] You can CONTROL the camera from your mobile phone and view quality images in real time from wherever you want (It connects remotely to the camera). You can also watch the videos recorded on the SD from your phone. Reliable Wi-Fi connectivity to access the surveillance camera from a mobile device via the App. Easy to set up. · [320mah BATTERY] Ensures continuous recording for 1 hours (day) and 1.5 hours with night vision (night) as long as the battery is fully charged. If you connect it to an external power supply, the operating time is unlimited. · [SMALL AND VERSATIL]: Not only is it a spy camcorder, thanks to its small size and powerful 3MP lens for taking 2K photos and FHD 1080P videos it can be used as a hidden camera, as an action camera, mount it on a drone... You can always take it with you, capturing the most beautiful moments of your adventures. Do you need a webcam? Simply connect the cable supplied with a smartphone, PC or TV and the camera will act like a webcam thanks to the built-in microphone. · [PROVED IN SPAIN] - 100% MONEY BACK GUARANTEE - Refuse imitations, Look for our brand DOJA Barcelona on the package to qualify for the 100% guarantee. If you have any problems with our product, send an email to: orders doja.es to solve your doubts, make the exchange or refund of the money.